TTi Exhaust-pipes are designed to directly bolt-up to specific manifolds for a hassle free installation. The outlet end of the exhaust-pipes are approximately 2" in front of the transmission cross member. 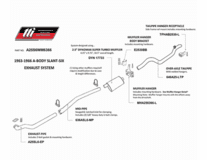 You will require our H-pipe or X-pipe assembly to get to the inlet of your mufflers. If running TTi Headers are in your future, just take out the exhaust-pipes and install Headers in it's place. Note: If we are told they are the "original" manifolds for the vehicle and not given the exact manifold numbers, then we will supply you what we feel may be the correct pipes. Due to the fact there may be several "original" casting numbers for the application, we will not assume responsibility for fitment if the information we are requesting is not provided.